This lesson is one in a series about nocturnal animals. Bats are fascinating and this lesson helps children have an appreciation for how wonderful and important this animal is! Enchanted Learning has a worksheet on bat anatomy, printouts, quiz, and other worksheets. 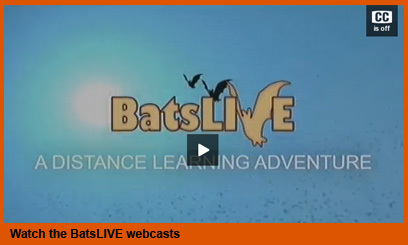 A unit on bats is a great way to expand of the concepts of observing and classifying. Studying bats allows for students to consider the physical differences between the two main groups of bats. It also provides a means for learning to compare different animals and their features. Lesson plans are available about: vibrations, sound waves, family sense, echolocation (for physical education), sensational ears, "What's the Flap? ", incredible bats, mammals on my mind, and stuffed bat. Bats! Why should you care? This web site has several purposes. The first is to inform children about bats and the issues surrounding them. Bats certainly are one of the most misunderstood animals on the planet. There are almost 1000 species of bats with a huge variety of living conditions, diet and habits. Fascinating creatures that are ending up on the endangered species list. The second purpose is to try and teach a research method for a younger grade. As a part of a week-long unit about bats, students will identify the characteristics of a bat and write an essay about bats. Student understanding will be enhanced through the use of books, poems, lectures, discussions, individual “flip books”, an art project, and the Internet. This story, Echo the Bat, for young children includes science information while telling the story. Most bats send out sounds that bounce off objects and return to the bat’s ears as echoes. A bat can determine where objects are, how big, and even the shape of objects so they know what is food and what they might run into. This lesson plans helps student understand echolocation. Stellaluna by Janella Cannon is a popular children’s book about a fruit bat and there are many lessons related to the book. This teacher's guide provides ideas for the exploration of Jannell Cannon's Stellaluna. Separated from her mother before she is old enough to fly, Stellaluna, an adorable baby fruit bat, finds her world turned literally upside down when she's adopted by a family of birds. This web page includes bat activities, lesson plans, printable, writing prompts, math pages and more. This web site includes activities involving listening, maps, literature, and science. CLICK HERE for a pdf copy. Investigating Bat Adaptations - Students investigate adaptations that increase a bat’s chance of finding food and surviving in a particular habitat. Bats: Maligned or Malicious -- Students explore their views of a threatened bat and present their findings. Build a Bat House -- Students build a bat house for their Backyard Wildlife HabitatTM or Schoolyard Habitats® Site. Frankie the Free-tailed Bat is a story about a Brazilian Free-tailed Bat (Tadarida brasiliensis) that was born in a cave located in the Texas Hill Country, but each year migrates to and from Mexico with thousands to millions of other members of its kind. 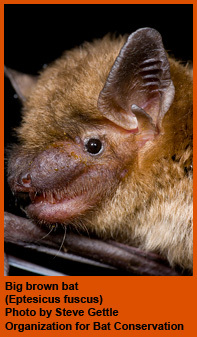 This lesson uses three books to teach about bats. This web page contains lots of links, activities, and ideas for teaching about bats. How much do you know about bats? Test your knowledge by answering nine true/false questions. Your score will be calculated as you go, and after answering all nine questions, we'll tell you your score. Bats navigate using reflected sound waves. This process, known as echolocation, allows these animals to "see" in the dark. To uncover objects, bats must first emit a series of sound pulses. These pulses travel outward and strike objects. The pulses are then reflected off the objects and return back to the bats. Detected by their large ears, the sounds are quickly analyzed by the brain's echolocation center. This analysis is so precise that the bat can locate moving fish through a critical analysis of the ripples produced at the water's surface. In this activity, students will learn about echolocation and reflected sound waves and how to calculate distance based upon detection of reflected sound waves. The accompanying teacher's activity book offers more than 220 pages of creative lessons that teach bat behavior, habitat, ecology and conservation in conjunction with the video. Students use essential skills such as reading comprehension, mathematics, written and verbal communication and more to learn key facts about bats while gaining an appreciation for global conservation concerns. The kit contains the award-winning 47-minute DVD and teacher's guidebook complete with reference information, bibliography, appendices and glossary. Students can participate in Internet-based learning activities for additional study. Bats eat night flying insects. If you would like to attract bats to your garden, you may want to plant flowers that are late day blooming or night-scented. These plants will attract night pollinators, like moths, which bats like to eat. This curriculum includes lesson plans and activities on Bat Babies, Cave and Karst Watersheds, Living in the Dark, and more.